Made from non-stick plastic designed for ease in baking and cleaning, meaning an effortless clean up and consistency that defines a new meaning to perfection every time. The Batter Dispenser will dispense the perfect amount of batter, you just position and pull the handle for quick and easy dispensing. 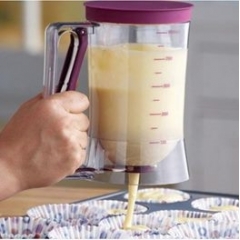 Great for cupcakes, muffins, pancakes, waffles and more.Designed with a stylish purple finish, this is the perfect addition to any baker's kitchen.